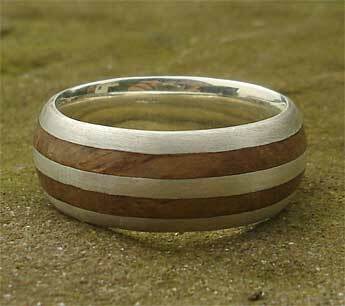 Men's Silver & Wooden Wedding Ring : LOVE2HAVE in the UK! 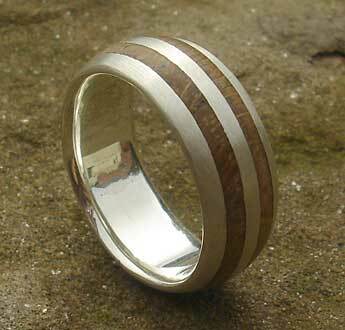 A domed profile sterling silver and wooden wedding ring with a twin wooden inlay for men. If you are looking for a unique wooden ring for a wedding ring, then this is the ring you need. The wood inlays come evenly spaced, and as the wood comes inlaid into silver, the silver protects the wood from wearing away, unlike a wooden ring made entirely from wood only. 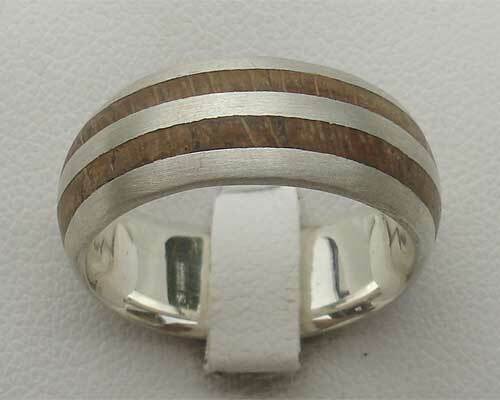 This ring measures 8mm wide and each oak inlay measures 1.6mm in width and contrasts nicely with the silver. We have chosen Oak as it is known to be a very durable type of wood. The ring has a comfort fit profile, and the silver has a satin matte finish. We sell other wider widths of this ring too but list this one at 8mm, a nice width for a man's finger. Please email for further details if you want to know more about the wider widths. Like all our rings in this section, the attention to detail is particularly pleasing with this wooden inlay ring as the inlays have been worked to contour precisely with the domed profile and to have two inlays reflect this quality especially so.